Jim from Deerfield, Illinois has emailed us his problem about keeping the spacing equal when cutting the flutes in a board. 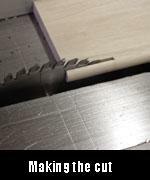 Jim�s email also informs us that he is using a �� round nose bit to cut the flutes. Thanks Jim. 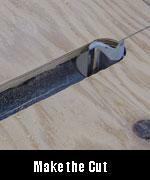 Tools and Materials: This requires the use of a table-mounted router, a router, 1� brass guide/ring nut, 1� straight bit, a �� round nose bit and a �� bull nose bit. 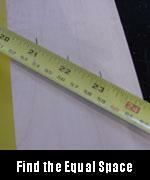 Material needed is 1 piece �� X 10� X 20� plywood, 1 piece of �� X 4� X 12� hardwood. 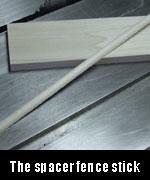 We need to make the spacer fence stick that is going to leave the equal spacing. The spacer stick needs to be made so it fits into the flute. 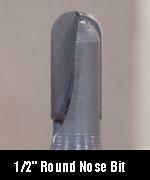 If we are going to use the �� round nose bit to make the flute then the router bit that will make the opposite shape is going to be the �� bull nose bit. 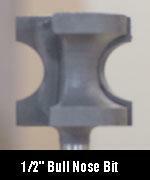 Remember that the spacer fence stick we make must be lower than the depth of the flute cut made by the round nose bit. 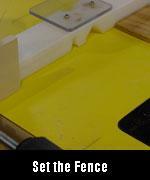 Cutting the Spacer Fence: The next step is to use the table saw to cut the shaped edge off the material at the right height to fit the flute. (See photo for the cut.) 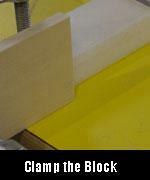 The two reasons we use a 4� wide board are first to give support and second to save fingers. 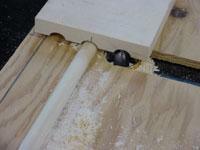 Milling thin a board is not safe. Set up tips: Identify, divide and mark the amount of flutes required into the width of the board. 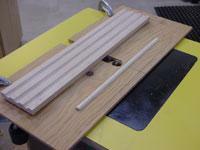 We have set up the fixture to cut an odd number of flutes with a equal number of spaces. 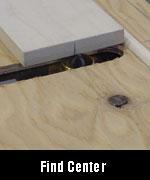 Find the center of the board and clamp the chute board into position. 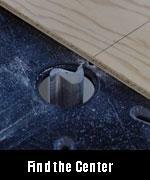 Make the cut for the center flute. 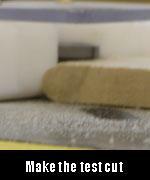 Make the first cut on a shorter piece of test material of the same width. 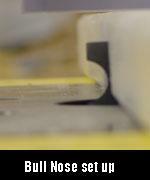 CAUTION: The round nose bit will want to push the board upward while cutting. 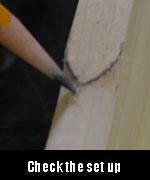 Make sure to keep your hands away from the router bit and always use a pushstick. Cut all of the needed pieces at this fence position. 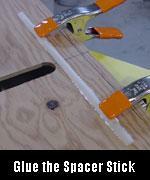 The next cut using the test piece: Place the center cut on the spacer stick and reposition the fence to match the outside marks, clamp the fixture then make the next cut. End for end the board and cut the other side of the board. 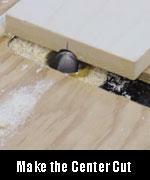 NOTE: make sure that the center cut is on the spacer stick for both cuts. 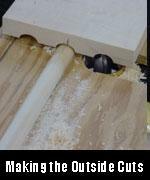 Check the test cut, if the fence is in the right position drill and bolt the fence to the router table through the pre-drilled holes in the router table. 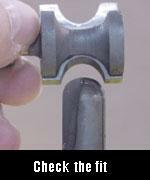 If not the right spacing re-position, re-clamp and re-cut a sample piece. For five flutes we just repeat the process but use the outside flutes from the center flute to position the next two cuts. 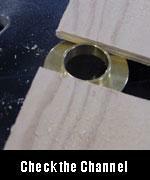 bove we have shown you how to make the set up for odd flute cuts with equal spacing. 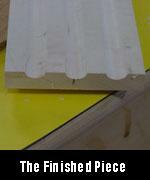 Here is the skill testing task: Outline the procedure to make 4 flutes with 5 spaces. The two challenges are 1) to build this fixture 2) figure the set up procedure for equal number of flutes and the odd number of spaces.